Sloan's Liniment (at right) was once a popular over-the-counter drug store item. Liniment (from the Latin linere, to anoint), or embrocation, is a medicated topical preparation for application to the skin. Sometimes called balms or heat rubs, liniments are of a similar or greater viscosity than lotions and are rubbed in to create friction, unlike lotions, ointments or creams, but patches, sticks and sprays are also available. Liniments are typically sold to relieve pain and stiffness, such as from sore muscular aches and strains, or arthritis. These are typically formulated from alcohol, acetone, or similar quickly evaporating solvents and contain counterirritant aromatic chemical compounds such as methyl salicilate, benzoin resin, menthol, or capsaicin. They produce a feeling of warmth within the muscle of the area they are applied to, typically acting as rubefacients via a counterirritant effect. The methyl salicylate that is the active analgesic ingredient in some heat-rub products can be toxic if they are used in excess. Heating pads are also not recommended for use with heat rubs, as the added warmth may cause overabsorption of the active ingredients. A.B.C. 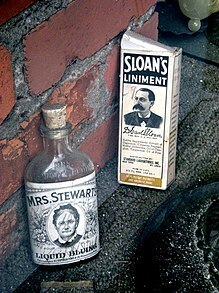 Liniment is a very old rubbing mixture or liniment. It was used for a long period of time (1880-1935 minimum) as a way of relieving pain caused by lumbago (lower back pain), sciatica, neuralgia, rheumatism, stiffness after exercise and other conditions. It was made from aconite, belladonna, and chloroform, leading to its name. However, there have been numerous examples of poisoning from the mixture, resulting in at least one death. Bengay, spelled Ben-Gay before 1995, is a liniment used to temporarily relieve muscle and joint pain associated with arthritis, bruises, simple backaches, sprains and strains. It was developed in France by Dr. Jules Bengué, and brought to America in 1898. The name Bengué was anglicized to Bengay. It was originally produced by Pfizer Consumer Healthcare, which was acquired by Johnson & Johnson. Flex-power is a liniment that claims to use nanotechnology in its formulation. Mentholatum Ointment was introduced in December 1894 by a US company founded by Albert Alexander Hyde. In 1975 a Japanese pharmaceutical company, Rohto Pharmaceutical Co., bought the rights to market the product and in 1988 it bought the entire Mentholatum company. The ointment also has a brand, "Deep Heat". Minard's Liniment: Dr. Levi Minard from Hants County, Nova Scotia, branded as "The King of Pain", created this preparation which he developed in the 1860s from camphor, ammonia water, and medical turpentine. Its use was popular in Eastern Canada. RUB A535 (also known as Antiphlogistine) is a liniment introduced in 1919 and manufactured by Church & Dwight in Canada. It is not well known outside of Canada, and is not sold in the United States. Tiger Balm was developed during the 1870s in Rangoon, Burma, by herbalist Aw Chu Kin, son of a Hakka herbalist in China, Aw Leng Fan and brought to market by his sons. Made of Menthol (16%), and Oil of Wintergreen (28%). Liniments are commonly used on horses following exercise, applied either by rubbing on full-strength, especially on the legs; or applied in a diluted form, usually added to a bucket of water and sponged on the body. They are used in hot weather to help cool down a horse after working, the alcohol cooling through rapid evaporation, and counterirritant oils dilating capillaries in the skin, increasing the amount of blood releasing heat from the body. Many horse liniment formulas in diluted form have been used on humans, though products for horses which contain DMSO are not suitable for human use, as DMSO carries the topical product into the bloodstream. Horse liniment ingredients such as menthol, chloroxylenol, or iodine are also used in different formulas in products used by humans. Absorbine, a horse liniment product manufactured by W.F. Young, Inc., was reformulated for humans and marketed as Absorbine Jr. The company also acquired other liniment brands including Bigeloil and RefreshMint. The equine version of Absorbine is sometimes used by humans, though its benefits in humans may be because the smell of menthol releases serotonin, or due to a placebo effect. Earl Sloan was a US entrepreneur who made his initial fortune selling his father's horse liniment formula beginning in the period following the Civil War. Sloan's liniment, with capsicum as a key ingredient, was also marketed for human use. He later sold his company to the predecessor of Warner–Lambert, which was purchased in 2000 by Pfizer. Look up liniment in Wiktionary, the free dictionary. ^ "Liniment". UK. Oxford Dictionaries. Archived from the original on 2013-06-17. ^ a b Everybody's Family Doctor. London, UK: Odhams Press LTD. 1935. p. 7. ^ Cross, John (March 13, 1880). "Letters, Notes, and Answers to Correspondents". Br Med J. 1 (1002): 424–426. doi:10.1136/bmj.1.1002.424. PMC 2239646. ^ Sinha, R P.; Mitra, S K.; Roy, P K. (1967-03-16). "Liniment A.B.C. poisoning". Journal of the Indian Medical Association. 48 (6): 278–9. PMID 6038536. ^ Weir, Archibald (February 15, 1896). "Fatal Case Of Poisoning By A.B.C. Liniment". The British Medical Journal. 1 (1833): 399–400. doi:10.1136/bmj.1.435.399-a. ^ Fisher, O D. (November 1954). "Accidental Poisoning of Children in Belfast: A Report of two years' experience at the Royal Belfast Hospital for Sick Children". Ulster Med J. 23 (2): 124–131. PMC 2480209. PMID 20476409. ^ Swinscow, Douglas (February 1953). "Accidental Poisoning of Young Children". Arch Dis Child. 28 (137): 26–29. doi:10.1136/adc.28.137.26. PMC 1988641. PMID 13031693. ^ Strickland, Eliza (25 January 2006). "Nice Nanostuff, But Is It Safe?". East Bay Express. Archived from the original on 19 April 2008. ^ "ICY HOT - Icy to dull the pain. Hot to relax it away". www.icyhot.com. Archived from the original on 9 March 2018. Retrieved 9 May 2018. ^ "Icy Hot - Chempedia". archive.org. 2 August 2008. Archived from the original on 2 August 2008. Retrieved 9 May 2018. ^ "Liniments and Poultices for Sore Horses". www.horsechannel.com. Archived from the original on 4 October 2017. Retrieved 9 May 2018. ^ "Is Horse Liniment Safe for Humans?". reference.com. Archived from the original on 9 June 2017. Retrieved 9 May 2018. ^ a b Millward, Robin (6 December 2010). "To all you neigh-sayers, this horse rub really does work". Archived from the original on 25 September 2017. Retrieved 9 May 2018 – via www.telegraph.co.uk. ^ "Horse Muscle Care And Joint Care Products - Absorbine". Absorbine. Archived from the original on 17 November 2017. Retrieved 9 May 2018. ^ Society, Jim Hodges, Curator, New Bern Historical. "Historical Society Curator Reveals Early 20th Century Success Story". newbernsj.com. Archived from the original on 5 November 2016. Retrieved 9 May 2018. ^ "Warner Lambert. - Pfizer: One of the world's premier biopharmaceutical companies". www.pfizer.com. Archived from the original on 7 November 2017. Retrieved 9 May 2018.